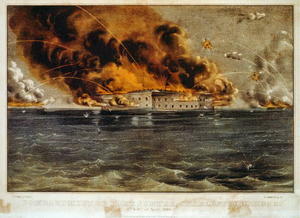 On April 20, 1861, the firing on Fort Sumter in South Carolina by Confederate soldiers marked the commencement of the Civil War. Eight days later, the United States Secretary of War ordered that Smithsonian Secretary Joseph Henry be issued "twelve muskets and 240 rounds of ammunition, for the protection of the Institute against lawless attacks." 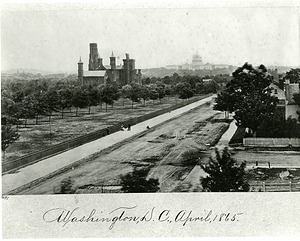 Its vulnerable location in the nation's capital­—between the US Capitol Building and the White House, cut off from the rest of the city by the Washington Canal, and close to Virginia, which lay just across the Potomac River—meant the Smithsonian was suddenly in danger. In late April, Henry wrote to naturalist Asa Gray that "for nearly a week we were in a state of isolation; cut off in every direction from the outside barbarians; with no other intelligence than that of threatened invasions from various quarters. . . secession flags could be seen from the high tower of the Insti[tu]tion waving over the adjacent portions of Virginia while war was waging in Baltimore." Physicist and Princeton University professor Joseph Henry had become the Smithsonian's first Secretary in 1846. Fifteen years later, he would face the most challenging period of his tenure. 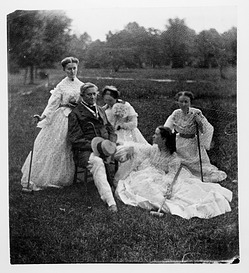 Joseph Henry lived with his wife and children in residential quarters inside the Smithsonian Building or "Castle." His daughter Mary's impressions of the war and its impact on life in Washington are recorded in her diary, part of the Smithsonian Institution Archives' Joseph Henry Collection. After the Battle of Bull Run, in July 1861, she wrote that "all day long bodies of stragling [sic] troops have been coming into the city & the streets lined with men seated upon the sidewalks in the pelting rain. Their officers many of them killed, their companys [sic] broken up they did not seem to know where to go." While the Smithsonian did not suffer physical damage as a result of the Civil War, the Institution's finances rapidly deteriorated. Congress was late in paying interest on the Smithson bequest, the institution's main source of funds, and after January 1862 made these payments in currency devalued by the war, rather than in gold. The Smithsonian had also derived income from investments in state bonds, but lost about four thousand dollars a year when several of these states joined the Confederacy. Even before the war had begun, Henry wrote to his friend and former colleague John Torrey that Congress had withheld its annual payment for the national collections, and that if it continued to do so, "we shall be obliged to close the doors or charge an admittance to visitors." During the war, these visitors included soldiers and others temporarily stationed in Washington. "The museum . . . has been a never-failing source of pleasure and instruction to the soldiers of the army," Henry wrote in his annual report for 1861. The Smithsonian's Board of Regents also experienced upheaval, losing eight of fifteen members in 1861. This depleted Joseph Henry's essential network of Smithsonian advocates on Capitol Hill, and meant he had to scramble to fill their seats on the board. Although it was not in his power to appoint regents, Henry worked to ensure that the board "not fall entirely into the hands of partizan [sic] politicians." The high cost of paper and printing during the war required the Smithsonian to curtail its publications program, but, according to Henry, the Institution's Meteorology Project "suffered more from the disturbed condition of the country than any other part of the operations of the Smithsonian establishment. "2 Henry's volunteer weather observer network was cut in half by the war, and urgent public business forced weather information off the telegraph lines, preventing the Institution from being able to issue storm warnings and other weather predictions. Although Henry had reservations about the war, he willingly lent his scientific knowledge and stature to the Union cause. After being asked for financial support by balloonist Thaddeus Lowe in 1861, Henry invited Lowe to demonstrate the balloon’s ability to provide telegraphic messages to persons on the ground. 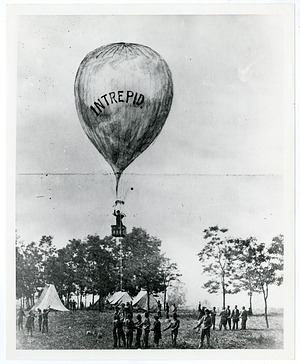 Because Henry saw the balloon as useful for military reconnaissance, he introduced Lowe to the Secretary of War Simon Cameron and to President Abraham Lincoln, and recommended that Lowe be appointed to organize a balloon corps within the Union Army. In 1862, Joseph Henry wrote to the Army's Surgeon General offering to produce a disinfectant for local hospitals treating wounded soldiers. "If you think well of the proposition," he wrote, "please furnish me with a supply of old junk bottles and I will fill them with the chloride." The Smithsonian prepared over a thousand bottles of the disinfectant in the next two months. Henry agreed to serve on the newly-established Permanent Commission of the Navy Department in 1863. Consisting of just three members, the board was charged with reviewing hundreds of proposals sent to the Navy for warship designs, signaling systems, torpedoes, underwater guns, and other ordnance. In May 1863, Henry wrote to his daughter Mary that "the Permanent Commission has met almost every night since you left." The board issued more than 250 reports over the next two years. One of the experiments the Permanent Commission undertook was the use of flashing signals for military communication between the Smithsonian and the Old Soldiers' Home. Although President Lincoln himself was present for at least one of these demonstrations, Joseph Henry was accused of treason by an Englishman who believed he was signaling Confederate soldiers. Other factors leading to suspicion of Henry included his failure to fly a US flag over the Smithsonian during the war, his former friendship with Confederate President Jefferson Davis, and the service (until 1861) on the Smithsonian Board of Regents of southerners who later assumed important positions in the Confederacy.3 Henry provoked further ire for disavowing the Institution’s association with a lecture series on the abolition of slavery. Henry had permitted the series' sponsor to use the Smithsonian’s lecture hall on the condition that no religious or political topics be discussed, but when he learned that a number of leading abolitionists had been scheduled to speak, he required a statement be read prior to each lecture disclaiming Smithsonian responsibility. 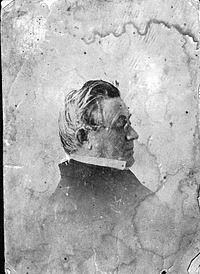 Joseph Henry's son Will, a clerk and copyist for the Smithsonian's library, died after a brief illness in October 1862. "His sudden and unexpected departure has plunged our family into the deepest sorrow," wrote Henry to a friend, geologist James Hall, but he recognized that his family was among thousands suffering from the recent loss of sons. A few months later, Henry wrote of Will’s death that "we are not called upon alone to mourn, every village of the whole country is grieving for the dead sacrificed to the ruthless spirit of war." 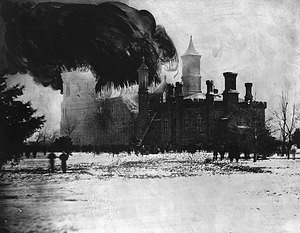 In January 1865, a major fire broke out in the Smithsonian Building, destroying the second floor and roof of the main building and portions of the towers. The lecture room, apparatus room, and picture gallery were lost, including an irreplaceable collection of American Indian portraits. Henry's office, containing twenty years of official correspondence, scientific papers, and diaries, was destroyed. Meteorological records and scientific instruments were also lost. Henry used to the fire to justify transferring much of the Smithsonian’s library to the Library of Congress, long a goal of his. Just a few months later, Joseph Henry was shocked and saddened by the assassination of Abraham Lincoln, whom he greatly admired and with whom he was personally acquainted. 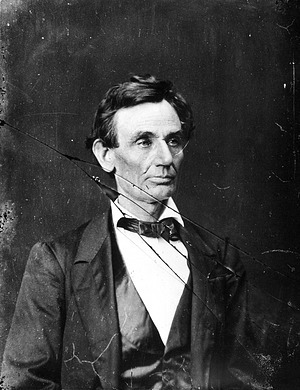 In a letter to his daughter describing the President's funeral, Henry wrote that he hoped Lincoln’s successor would "be imbued with the same honesty of purpose, the same kindness of heart, and the same moderation and prudence of action." The events of the war years furthered Joseph Henry's streamlined vision for the Smithsonian. The 1865 fire, although physically destructive, helped Henry make the case for moving the Institution's library and let him shed the responsibility for public lectures by not rebuilding the lecture hall. Within the next few years, Henry also transferred the Smithsonian's fifteen to twenty thousand botanical specimens to the Agriculture Department (they would be returned to the Smithsonian at the request of Secretary Spencer F. Baird in the 1890s) and its "large collection of human crania" and other "specimens pertaining to anatomy, physiology, medicine, and surgery" to the Army Medical Museum. These collections too would be returned as the National Museum expanded after Henry's tenure. The war's impact on the Smithsonian's meteorological program also bolstered Henry's call for the establishment of a national weather service. With a more focused and limited program, the Smithsonian became well-positioned for the future. While Henry himself suffered great loss during the Civil War years, he would successfully lead the Smithsonian into the next decade. Kathleen W. Dorman, "'Interruptions and Embarrassments': The Smithsonian Institution during the Civil War," Smithsonian Institution Archives. Kathleen W. Dorman, "The Smithsonian: Recycling Since 1862," The Bigger Picture (blog), Smithsonian Institution Archives, April 22, 2011. Pamela M. Henson, "Muskets Issued to Smithsonian as Civil War Begins," The Bigger Picture (blog), Smithsonian Institution Archives, April 20, 2011. Pamela M. Henson, "The Vanishing Board: Governance at the Smithsonian during Civil War," The Bigger Picture (blog), Smithsonian Institution Archives, June 2, 2011. Ellen Alers, "How Hot Was It At Bull Run?," The Bigger Picture (blog), Smithsonian Institution Archives, July 20, 2011. Aly DesRochers, "Wartime in Washington—Mary Henry on the First Manassas," The Bigger Picture (blog), Smithsonian Institution Archives, July 21, 2011. Aly DesRochers, "From Defense to Decoration: the Renwick Gallery in the Civil War," The Bigger Picture (blog), Smithsonian Institution Archives, August 22, 2011. Aly DesRochers, "Controversy in the 'Castle'," The Bigger Picture (blog), Smithsonian Institution Archives, November 10, 2011. Aly DesRochers, "Hope for the Holidays: A Civil War Season in DC," The Bigger Picture (blog), Smithsonian Institution Archives, December 22, 2011. "Stories from the Smithsonian," Smithsonian Institution Archives, September 6, 2011. "Smithsonian Online Lincoln Conference," LearningTimes, February 4-5, 2009. Ford's Theatre's "Remembering Lincoln: Responses to the Lincoln Assassination."